This Beef Stew was pretty traditional and was not a canvas for my current flirtation with all things Japanese. Cut up your steak – the cross cut is a stewing cut so needs a long slow cook. Add your stock cube and a ½ cup or so of water, the Worcestershire Sauce, Tomato Paste and Sherry. Cook away for at least another hour. Add parsley just before serving. 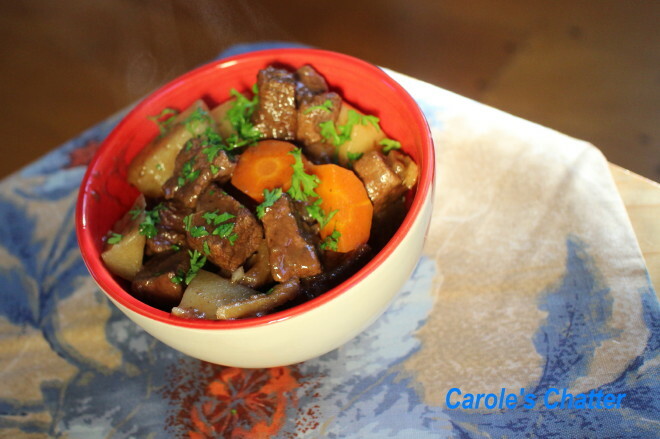 Hearty and heart warming stew. Perfect for a cool evening! I agree with Beth Fish Reads, for a cool evening there's nothing like it. Hearty and comforting.